SHOT Show is an industry-only show held each year in Sin City. It’s where the industry unveils its latest and greatest. Outdoor celebrities show up to hype new products and meet, and greet. It’s a venue where outdoor and tactical merge to create the largest gun show in the world. I always enjoy seeing new products like Nikon’s Advanced BDC Reticle that when teamed with their Distant Lock technology creates a first focal plane world where aiming points remain the same regardless of the magnification setting. Imagine that on my 6.5 Creedmoor Bergara rifle? There’s also big news in conservation. 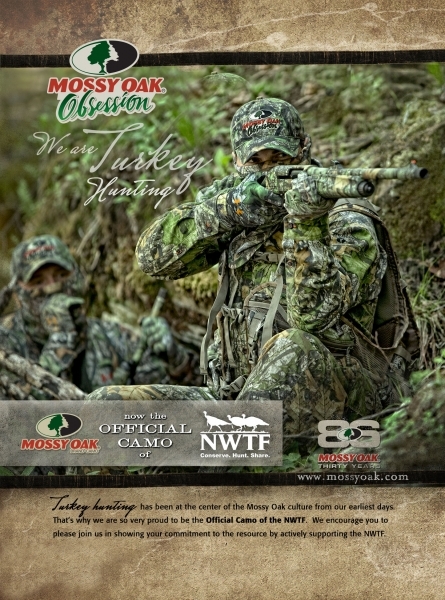 Mossy Oak, NWTF and DU have teamed up. Mossy Oak is now the official camouflage pattern for these prestigious organizations and you can bet this partnership will lead to greater commitment to our hunting heritage. As for celebrities, they weren’t hard to find in the crowd. I have to be honest, two of my favorites are Bone Collector team members Nick Mundt and T-Bone. Regardless of where I see them they always stop everything for a quick chat. Nick’s an old South Dakota boy like me and T-Bone is just a great guy. While the rest of the industry was at the Thursday night awards I spent my last night in Vegas with two celebrities who got me started down the outdoor road: my parents. For nearly a dozen years I have met my folks in Vegas which is near their winter home. Sure I miss some of the nighttime festivities, but spending time with family is important and having my son Cole along to carry on the family outdoor tradition means even more. Instead of a big steak on the strip we quietly slip to the outskirts of town to our favorite little fish shack, Hush Puppy, and enjoy the quieter side of Vegas. SHOT Show 2016 is now in the books, but the new hunting and shooting products, and the great get-togethers will provide memories for years to come. Remember, more photos from this post and new videos at markkayser.com.